Wudang Tai Chi Chuan was given its name by Cheng Tin-hung who never claimed to be teaching a particular style of Tai Chi Chuan. He named it after Chang San-feng who lived on Wudang Mountain and the name Wudang was taken to acknowledge Chang San-feng's status as the founder of Tai Chi Chuan. You will notice that on this site the names Practical Tai Chi Chuan and Wudang Tai Chi Chuan are used interchangeably. Practical Tai Chi Chuan International is the name under which Dan Docherty has registered the system. The name comes from that given to Cheng Tin-hung's style by Chinese martial arts journalists who thought it was a "Practical Tai Chi Chuan" style. The "International" reflects the fact that it is taught in many countries and to students from many more. 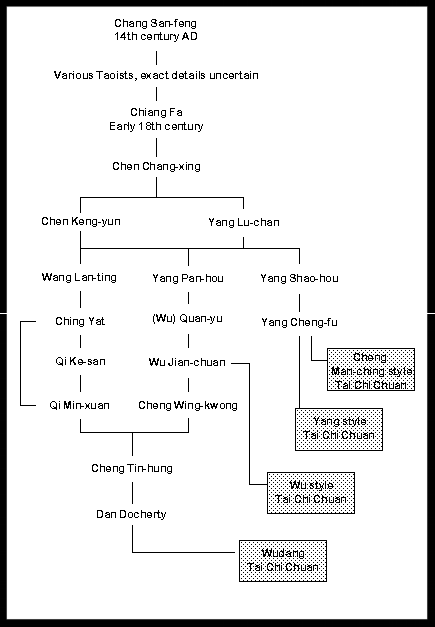 As you will see from the lineage of the system there are links to the Chen, Wu and Yang family styles. Though it is perhaps most heavily influenced by the Yang Pan-hou and Quan Yu transmissions. Cheng Tin-hung first learned Tai Chi Chuan from his uncle, Cheng Wing-kwong, who was one of only three "inside the door" students of Wu Jian-chuan. His uncle taught widely in South East Asia, particularly in Malaysia. However, Chen Wing-kwon later brought Qi Min-xuan from Henan Province to teach his sons and nephews. Qi Min-xuan was from Wen County, Hebei Dao in Henean Province. He had adopted the Buddhist name of Zhi Meng, which means Sagacious Elder. Qi was originally taught by his father Qi Ke-san, but his main teacher was a Buddhist monk named Ching Yat (another Buddhist name, which means Pure One). Ching Yat had befriended the renegade soldier, Wang Lan-ting, who had (after killing some Manchus) been forced to flee to the temple where Ching Yat resided. Wang had learned from Chen Keng-yun, the son of Chen Chang-xing, and later from later from Yang Lu-chan. Apart from the fact that he was an officer in the Manchu Imperial Guard and the top student of Yang not much is known of Wang or who was taught by him.